Lake Winnipeg is inextricably linked to a vast area of North America from which it collects surface runoff and groundwater. Its watershed covers nearly a million square kilometers stretching from the Rocky Mountain foothills to within 80 kilometers of Lake Superior. This land area is 40 times greater than the surface of Lake Winnipeg, a ratio surpassing that of any other large world lake. Consequently, the amount of dissolved and particulate material (inorganic and organic chemicals, sediments, and detritus) received by Lake Winnipeg is comparable to that in more densely populated regions such as the Great Lakes basin. 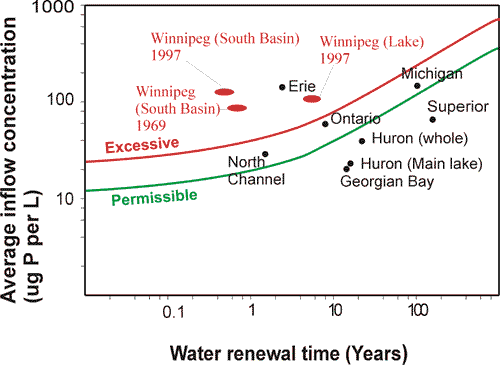 For example, the amount of phosphorous (a plant nutrient) flowing into Lake Winnipeg today, mainly via the Red River, is similar to that which entered Lake Erie during the 1960s and 1970s prior to phosphorous controls. Altered precipitation patterns and river flows associated with climate warming can potentially influence the supply of watershed nutrients to Lake Winnipeg. Climate is the single most important factor controlling the biodiversity in Canadian lakes, (1) with warmer southern lakes more biologically diverse than colder northern ones. Consequently, any change in climatic conditions will elicit a response in ecosystem structure and function. Scientists have gained a good understanding of the response to climate warming of smaller, undisturbed lakes in the Experimental Lakes Area, north-western Ontario (2). Several unexpected changes in the physical, chemical and biological processes in these lakes were caused by modified interactions between weather, watersheds and stream flows. Recent investigations on Lake Winnipeg have also revealed the importance of climatic factors even in large aquatic ecosystems. Further warming of Lake Winnipeg is expected in the second half of this century as air temperatures increase with doubling of global CO2. Based on our knowledge of air and water temperature relationships (4), South Basin summer water temperatures could rise from their present range of 20° – 25°C to between 25° and 30°C by 2085. Warming will affect the entire water column, not just upper surfaces, in this relatively shallow well-mixed lake. Open water seasons will lengthen and ice cover periods will shorten. The capacity of Lake Winnipeg water to hold dissolved oxygen will decline as water temperatures increase. River flow monitoring by Environment Canada indicates that river flows to Lake Winnipeg have changed substantially over the last several decades. Relatively less water is now delivered to the North Basin by the Saskatchewan River because of increased irrigation and declining glacier-sourced flows (5). Conversely, increased precipitation and runoff yields (6) in the Winnipeg and Red River catchment area has resulted in increased flows into the South Basin. These changes appear to correspond with predictions of future water supplies based on climate data analyses which suggest that precipitation will increase in regions where it is already high and decrease in more arid regions (7). As a consequence, mid-continental summer droughts may become more frequent and intense (8) with prairie river flows into Lake Winnipeg declining even further (9). In contrast, rainfall in the Boreal Shield east of Lake Winnipeg is predicted to increase about 15% (10). Consequently, higher flows in the Winnipeg River, currently providing 43% of flow to Lake Winnipeg, may compensate for losses of the Saskatchewan River. Red River flows, predicted to increase by 50% (10) will have the most important impact on Lake Winnipeg because, in turn, the river will deliver more phosphorus to the lake even though human and animal populations in the basin may not increase appreciably. Annual evaporative losses, equivalent to 2-12% of Lake Winnipeg’s south basin volume (11) will increase with warming, and together with altered river dynamics, may complicate lake management strategies for water quality improvement. Due to its’ relative shallowness and reduced volume, Lake Winnipeg is strongly characterized by its inflowing rivers. River flows determine the length of time water remains in the lake (water residence time) before it is diluted or flushed out by new, incoming water. Natural variability in Lake Winnipeg water residence time is now complicated by lake regulation for power production and may be further compromised by climate induced changes in hydrological cycles. Closely tied to this water residence time is the growth and accumulation of planktonic animals (zooplankton) and algae (phytoplankton). With sufficient nutrients and sunlight, the longer water stays in the lake the more algae and zooplankton will accumulate because they are essentially floating organisms whose distribution is controlled by water currents and mixing. The quality of water in Lake Winnipeg has deteriorated during the past three decades principally as a result of excess phosphorus loaded into the lake from watershed sources. Phosphorus is the crucial element controlling the proliferation of blue-green algae that now accumulate as surface scums and contribute to Lake Winnipeg’s ranking as the most eutrophic large lake in the world (12). Monitoring of watershed nutrient sources (Lake Winnipeg Stewardship Board Report, 2006) has revealed that crop land fertilizers, susceptible to surface runoff and flooding within the Red River Basin, provide the largest amounts of phosphorus to the lake. Additional nutrient loading is contributed by human and livestock wastes, particularly those in close proximity to water. Figure 1 shows that the inflow of phosphorous to Lake Winnipeg is excessive. 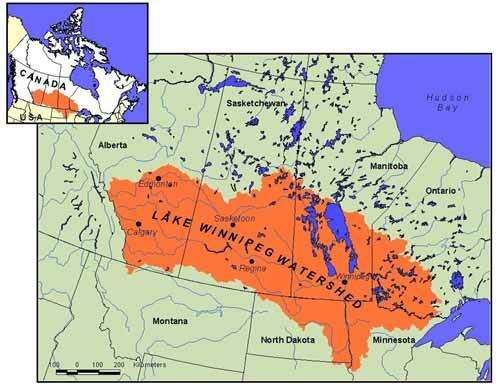 Most of the phosphorous in Lake Winnipeg originates from the 6 million people, 17 million livestock, and agriculture in the drainage basin. The more extreme and variable weather events predicted by global climate models may exacerbate the water quality decline in Lake Winnipeg by enhancing nutrient loading. For example, extreme flooding of the Red River in 1997 carried large amounts of agricultural soil, manure, and organic detritus into the South Basin, elevating phosphorous and nitrogen to record high levels and reducing water clarity to its lowest point in the summer of 1998. By 1999, these nutrients had moved into the more transparent North Basin where thick mats of blue-green algae developed and covered 8,000 sq km of its surface. Even more recently, record Winnipeg River and Red River summer flows in 2005 carrying high phosphorus loads were followed in 2006, a warm dry year, by the most extensive blue-green blooms ever observed throughout Lake Winnipeg. Periods of prairie drought, with reduced river flows, will likely not bring immediate respite from blue-greens as these species proliferate in hot, sunny conditions. High in-lake phosphorus concentrations will be maintained through internal recycling from sediments and intensified feedback from zooplankton. In addition, the increased need to retain lake water during summer months for power production in winter may exacerbate blue-green algal growth in low water years.